The Government of India does not want to make public its Standard Operating Procedure (SOP) intended for use, by security forces, in areas where militant groups are active and use civilians as 'human shields'. This has come to light in a right to information (RTI) reply by the Ministry of Home Affairs (MHA). Revealing this, senior RTI activist Venkatesh Nayak, who filed the RTI application, said, the MHA rejection "invoking security and strategic interests of the state as grounds for refusing disclosure" has come despite the fact that MHA has admits existence of the SOP, and the contents of its draft were revealed in a written reply to a query by P Kumar, AIADMK MP from Trichy, in 2013. The MP wanted to know, with reference to civilians killed during anti-Naxal operations, whether it was true that many villagers in this country have complained that the Naxals were using them as human shields. In his reply, the then Union Minister of State for Home Affairs revealed that a draft SOP on 'Maoists using villagers as human shields' was circulated for comments to the armed forces and states affected by left wing militancy. The minister's reply especially insists that the Central Armed Police Forces (CAPFs) must "take utmost care to avoid casualties/injuries and any form of harassment of locals while undertaking anti-Naxal operations even when they are used as human shields by the Maoists". Based on the former minister's reply, Nayak made an RTI application on instructions issued to all State governments to "adhere to the highest standards of human rights" during anti-Maoist operations, SOP on ‘Maoists using villagers as human shields’ circulated to the governments of Naxal affected states, comments received from states, the latest version of SOP relating to the use of civilians as human shields, as also the version of SOP relating to the use of civilians as human shields by militant groups issued for the North-Eastern states and Jammu and Kashmir (J&K). The RTI query was especially meant to ascertain which SOP was used by the security forces, who tied a youth to a pilot vehicle being driven around by security forces engaged in counter-insurgency operations in Budgam, J&K. 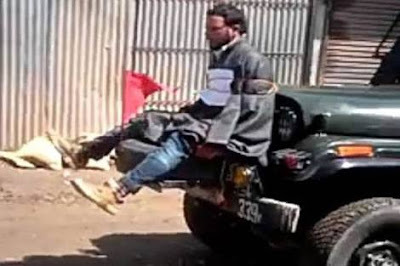 The incident occurred in the poll-bound Lok Sabha constituency of Srinagar, and its video went viral in April 2017, soon after which the Indian Army ordered a Court of Inquiry into the incident. "The findings of the Court of Inquiry are yet to be made public. A few weeks later, the officer responsible for this incident received a commendation for his performance in counter-insurgency operations, from the Chief of the Indian Army", comments Nayak, who is with the advocacy group Commonwealth Human Rights Initiative. "In July, acting on the plaint of the victim, the J&K State Human Rights Commission directed the government to pay Rs 10 lakhs as compensation, unequivocally describing what several others called a 'life-saving strategy', 'humiliation, physical and psychological torture and wrongful confinement' of the victim which the law does not permit even for a convict", adds Nayak. While rejecting the RTI plea, the MHA official said, the "information/documents, sought in your RTI application dated April 19, 2017, are secret in nature and disclosure of such documents would prejudicially affect the security and strategic interests of the State. Therefore the desired information/documents cannot be provided as per Section 8(1)(a) of the RTI Act, 2005." Nayak says, it is clear from the reply that "SOP to guide security forces for handling situations where militant groups use 'human shields' exists" but the MHA "does not want to disclose it", adding, he would now submit an appeal to the Central Information Commission. "1. Remember that the people you are dealing with, are your own countrymen. All your conduct must be dictated by this one significant consideration. 2. Operations must be people friendly, using minimum force and avoiding collateral damage – restraint must be the key. 3. Be compassionate, help the people and win their hearts. Employ all resources under your command to improve their living conditions."